Toronto, Canada; September 2005 – Spaark will launch a unique new printable photo album solution for professional digital photographers to prepare wedding preview and portrait presentation albums at this year’s PhotoPlus Expo in New York, October 20-22. “With more and more photographers turning to digital, we have developed this in-house printing solution as a response to the need for convenience, quality and differentiation. 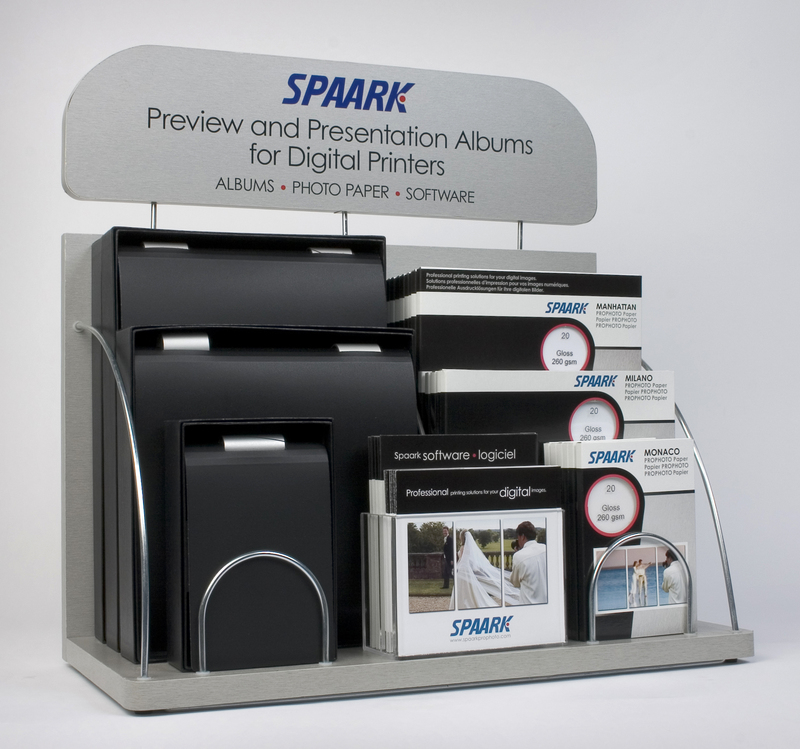 The Spaark system also provides flexibility, self-sufficiency and savings in time and cost when compared to alternative sources of preview and presentation albums,” said Rob Allen, Category Manager - Prophoto, Spaark Ltd. The product line has been successfully launched in the UK and has now been further enhanced to respond to the specific needs of the North American market. The Spaark Printable Photo Album is a modular solution allowing the professional photographer to tailor each album for the client by selecting the most suitable covers and pages. Once the photos are downloaded to the PC, the Prophoto software walks the user through selecting and sizing the photos. The software provides functionality to quickly arrange the photos on multiple pages in the required format and order, add individual photo numbers or captions and finally add a copyright watermark to each photo if desired. Print directly onto the Spaark album pages using an inkjet photo printer and then slide the pages into the album binder. The result is a high quality, sophisticated preview album for presentation to clients. The competitively-priced components include a range of black premium bonded leather covers with aluminium binding cylinders, packs of pages in different finishes, imaging and cataloguing software and black presentation boxes. Each album is capable of holding up to 30 pages. Spaark will be introducing the full professional product line in Booth 474 at PhotoExpo Plus in New York’s Jacob Javits Convention Centre from October 20-22 (www.photoplusexpo.com). For further information, please contact Rob Allen (rob@spaark.com) to arrange a preview today or any day of PhotoExpo Plus or via telephone at 905-565-7560.
range of products designed for the increasing number of digital camera users looking for creative ways to output their digital images. The Spaark management team has spent many years in the printing and paper-converting arena, producing and marketing quality products for both office and consumer markets.